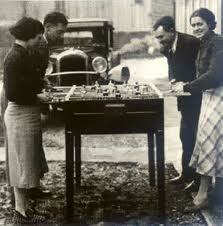 Patents for similar table games date back as early as the 1890s in Europe. However, the origin of foosball started in 1921 by Harold Searles Thorton from the United Kingdom (UK patent no 205,991 application dated 14 October 1921 and accepted 1 November 1923). He invented the game due to the popularity of football in Europe (known as soccer in the United States). The popularity of the sport was spreading so rapidly Harold decided to make a game that people could play in their homes. Since Europeans called the real sport football, Harold decided to call his new creation "Foosball". Believe it or not, the game's design inspiration came from a box of matches. The vision started where the matches were laying on the top of the box and extended past the edge of the box, much like the rods in foosball. The game was eventually brought to the United States in the 1950's by Lawrence Patterson. The game reached its peak popularity in the U.S. in the 1970's. During this time period, the game could be found throughout bars and pool halls everywhere throughout the US. In 2002, the International Table Soccer Federation (ITSF) was established in France with the mission of promoting the sport of Table Soccer as an organizing sports body, regulating international competitions, and establishing the game with the International Olympic Committee (IOC) and General Association of International Sport Federation (GAISF). In recent years, the invention of video games have since taken the popularity away from the game but there are many communities where the game still thrives today. You can still find many tournaments and local bars that have foosball tables. Players have begun to perfect the game to a point where it has reached a new peak performance. Watching professionals will give you a whole new respect for the game and what they are able to do with rods that only move forward and back. Today, expert players have been known to move balls at speeds up to 35 mph in competition.